Been putting TJ’s everything but the bagel seasoning on everything these days! The options are limitless. 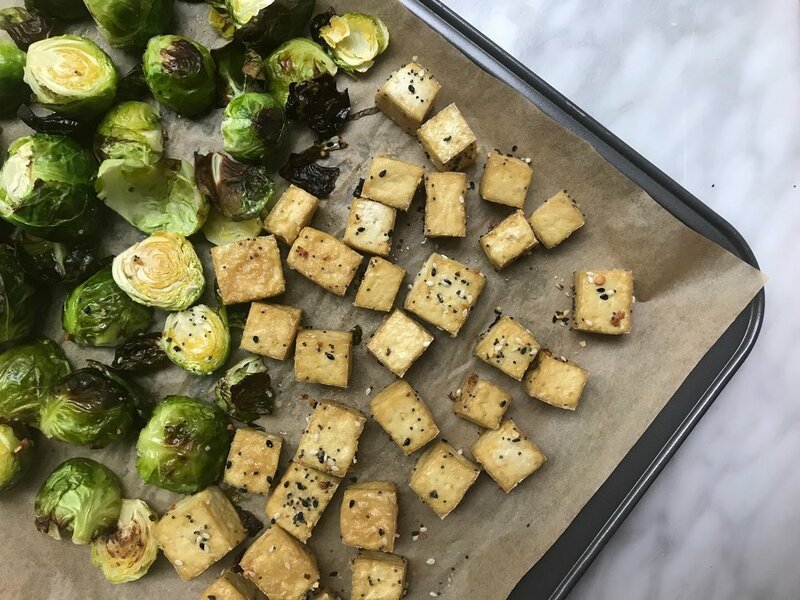 Usually I add plain sesame seeds to my baked tofu, but when my mom was visiting over the weekend it was her idea to use this instead after realizing I had ran out of sesame seeds and VOILA – SO good! Made with only 3 ingredients and turned out so crispy!! Will also need parchment paper to line the sheet pan with. 2. Slice the pressed tofu horizontally into sixteen pieces (each will be about 1/4-inch thick). Set aside. 4. Place tofu on parchment paper covered sheet pan and evenly distribute tofu pieces across the pan. No oil yet! 7. Put back in oven for another 2-3 minutes. 8. Remove from oven and allow tofu to cool for a minute or two on the pan before serving.